Tthe “little black dress” is one of the best fashion investments you can make. Every petite woman looks great in it. Here are five good reasons to own the little black dress (LBD). Coco Chanel introduced this timeless classic. 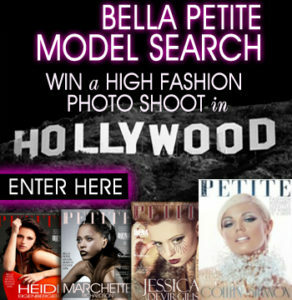 Since the inception of Bella Petite Magazine, there have been some serious changes in the modeling industry concerning petite models. You can’t go wrong in black and white! These colors will work all year round for you for almost any occasion. Some people believe you can only wear white during the Spring to Summer. How to create a natural clean fresh look is airbrush water-based foundation just a few drops and you achieve flawless perfection in under 3 minutes! Ann Lauren has teamed up with the prestigious broker Keller Williams International and their amazing luxury real estate agent professionals to roll out LiveBeautifully.TV a luxury lifestyle media network that will feature luxury retailers high-end merchandise, and services, along with home design strategies, and beautiful homes.